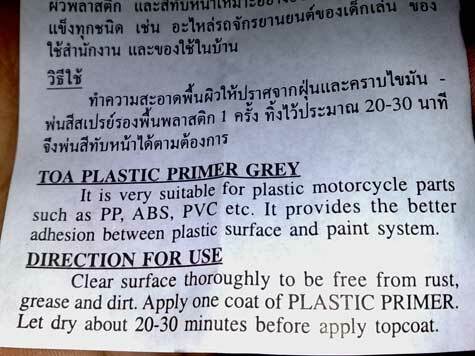 Here's a lucky find, a plastic primer paint from TOA paint of Thailand. 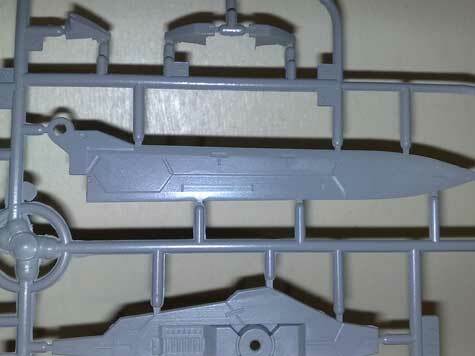 Its supposed to be Acrylic Lacquer based and works ideally for ABS, PVC and PP plastic types. It's cheap too at only $2.30 per 400 cc can. The color of the primer coming out of the can is white. The plastic primer was originally created for preparing the surface of the plastic parts of motorcycles so that the final paint can stick easily onto the surface. As a backgrounder, I'm located in some far off place from the country's capital which makes model kit paints both sparse and expensive. Because of which I have to be equally resourceful in sourcing alternative paints to use in my recently resurrected model kit building hobby. I've been using Future acrylic floorwax both as a primer and a gloss coat, but the problem with hand brushing it on is that it doesn't get evenly distributed on the model kit sometimes, especially when you applied too much and the Future starts obeying the laws of gravity and runs creating solid streaks on the surface. Given the choice, I would prefer to use GSI Creos Mr. Surfacer because this is what pro-modellers are using. Its supposed to be a good levelling agent, ensuring that you have a smooth level surface. Plus of course it grips well on plastic and the modelling paint will stick well on it. 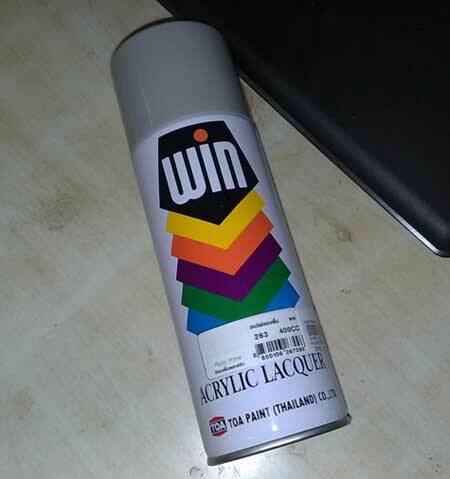 There is also a bottled version of this that you will have to mix with thinner if you are planning to airbrush it on. So far so good, I found that the plastic primer is thinly distributed on the surface of the model kit, without having to use the spray head of a GSI Creos modelling spray paint. Tamiya and GSI Creos spray heads are known to create the ideal spray mist for model kit parts, so I've been swapping their spray heads with the commercial spray paints I've been using. Below is a shot of some model kit parts I've finished painted on with a Pylox Grey lacquer after first applying plastic primer from TOA. Doesn't come off easily too, except of course when you scratch it with something hard.